With tonight's Apple event expected to be centered mostly around the market release of its Apple Watch, the more polished clones of the wearable began to pop up. 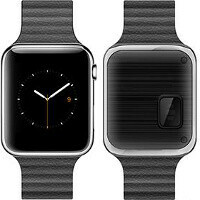 Welcome the Zeaplus Watch, an upcoming smartwatch that can potentially beat all other companies willing to clone Cupertino's gadget and steal the crown as being the most bold and brazen Apple Watch knockoff. The Zeaplus Watch will come with an aluminum body, but apart from borrowing Apple Watch's looks, this copycat will come with some features that will not debut alongside its progenitor. We'll have a 2MP camera at the bottom of the watch (which will require you to take it off if you want a snap a picture), as well as a slot for a micro SIM card. Yes, the Zeaplus Watch will allow you to make and receive calls right from your wrist. Bluetooth 4.0 is also on board. Feature-wise, the Zeaplus comes with a pedometer, a heart rate sensor, and "more". It will be available in silver, gold, and strangely enough, grey. This piece of wrist-worn gadgetry will work with both iOS and Android. Pricing is unknown at this point. The Zeaplus Watch will be available for preorder in late March from the manufacturer's website. Alright, the phone feature and Bluetooth features are pretty cool, but yeah, they stole that design. And I doubt that it'll be anywhere as nice as Android Wear or Apple Watch. We'll have a 2MP camera at the bottom of the phone... don't you mean watch? But they say that it is capable of making phone calls so I guess you're both right? Umm yeah. Thanks for spotting this. and yet people troll about why Apple sues others , they need to have the strongest law department for these reasons. For reasons like this? Yeah sure, I'll agree with you there. lol, calm down man, it'll happen when it happens. Hopefully their live streaming of the event goes off better than it did last time. I heard they had all sorts of issues. Shameful. Aren't buyers embarrassed to knowingly buy and wear/use a fake product? I will never understand the appeal of knock-offs or the people who buy them; they just strike me as pitifully desparate and pathetic. I think selling the watch for £299 in the UK when it's $349 in the USA is also shameful! I know there are other taxes etc, but I'm sure Apple could do better than this. £199 would have been a fair price, £249 at a push. I was really looking forward to this watch but I will leave it until Apple Watch 2, at which point they will probably drop the price a bit. Or I may just abandon the Apple gravy train altogether and get myself a nice new gorgeous Samsung GS6 Edge instead. Greedy greedy Apple! !